Houghton Vest Pocket Ensign. Photograph gallery. 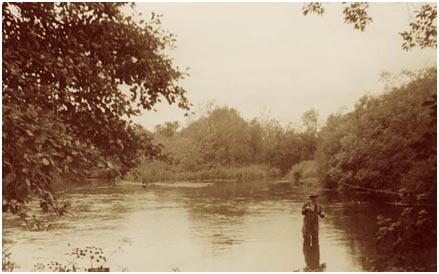 Fly fishing on the River Itchen, Hampshire - at the turn of the century. Which in this case means 2001. The shutter speed wasn't quick enough to capture the rod which is blurred out of existence. 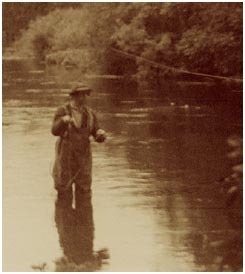 When taking the picture I was certain that the fisherman's reflection was entirely within the frame...so much for the waist level finder. The clarity isn't too good, so the best option is to sepia tone the final print.